Happy Friday guys! Started this week out with a nasty summer cold but all is better and now I'm ready for the weekend. Hope your week was just as fun as mine was!! 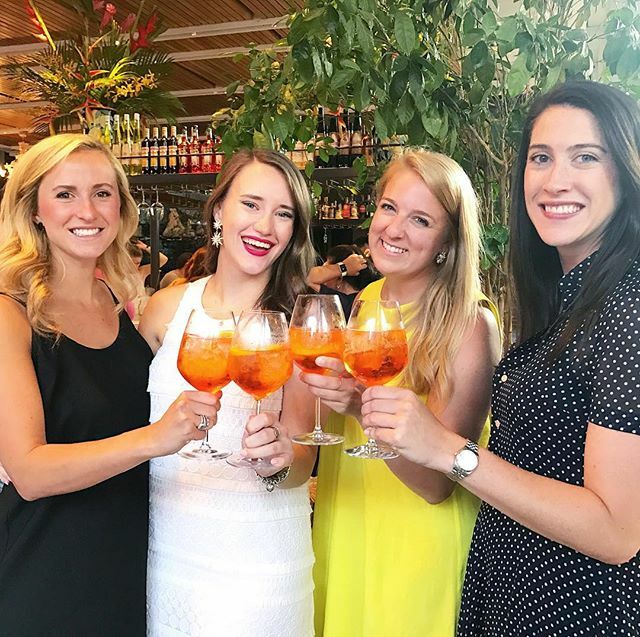 NYC Life: On Wednesday Carly, Lauren and I hosted a happy hour at Santina with Aperol and had the very best time! It's always so fun to get our friends together and drink the night away. Last night Andrew and I rode our bikes down to Battery Park and saw Dunkirk at our favorite theater (they have the relining chairs). I do think it was an amazing movie but I didn't think it lived up to all the hype I've been hearing. Weekend Plans: Andrew and I have a wedding tonight in Rye and then tomorrow morning we're off to Brigantine for the weekend. Andrews family always rents a house two weeks out of the summer and this weekend we're finally in town to go visit! Most Popular Item This Week: This bralette! I mentioned it earlier this week and you all seemed to like it. If you want a more in-depth review, let me know below! A pony tail holder that looks like it should be Gucci! My favorite swimsuit in NAVY!!! Amazon Purchases: Thinking of adding this into the weekend update because I have a seriously bad obsession with buying things on Amazon. I literally buy everything from here and each week I keep finding new toys! A Must Read: Big news on the work side of things -- Disney bought a majority share in BAMTech which is huge!